I thought I'd write something special with Womens' Day just around the corner. Sometimes, you don't need to search far and wide for inspiration. It's right close to you. Look around you - a friend, a co-worker, a movie, a book, travel...inspiration can come from anywhere. In this case for me, my ever-smiling and oh-so-hardworking friend Keshia is an inspiration. And I want to share what makes her tick with you. This famous quote by Julia Child fits like a glove as the beginning to our interview with Chef Keshia D’souza. 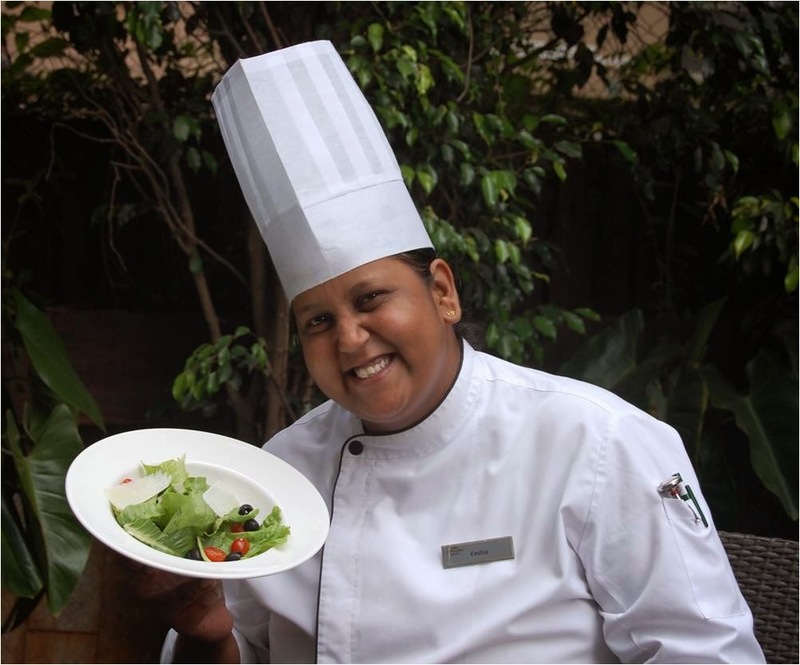 Currently Chef de Partie at Courtyard by Marriott Pune City Centre, she found cooking to be her passion at the tender age of eight. With over six years of experience in the kitchen, here she is in her Chef’s whites with a smile on her face and her affable personality already evident. How did your passion for cooking begin and what inspired you? I got the idea from the show F.R.I.E.N.D.S. and watching Monica do her magic in that kitchenette. Moreover, I was fascinated with the idea of a lady leading the kitchen! Growing up in a joint family, I saw my mum juggle a lot in the kitchen. I used to observe how she would churn out meals that took care of everyone’s eating preferences! My grandfather was a great cook too. I recall as a kid making some not-so-round but soft chapattis with him. But it was only at a dinner party at home for which I subbed in for my unwell mother and prepared a lavish Goan meal for 20, when I really thought of pursing being a Chef. Being a woman, was it easy getting into the profession and climbing your way up the kitchen ranks? I did my hotel management course from a private college. Before getting a job in a hotel kitchen, it was at a humble little bakery in Mumbai where I began my career. Regardless of gender, it’s about simply working hard and working long hours, sometimes 14-or 15-hour shifts a day. When you’re in the kitchen, the only thing that counts is proving your mettle. What aspect of your job that keeps you so passionate and motivated? It’s all about the joy in making people happy. Today, everyone is a food critic, everyone’s preferences differ. What keeps me going is rising up to the challenge of pleasing people with the food I cook. Food is so versatile. There’s not a day that I have stepped out of the kitchen without learning something new. How do you survive the 'heat in the kitchen'? Make no mistake, working as a chef is a high pressure job. You must never take criticism or feedback in a negative way but use it only to develop professionally. Nothing hurled at you in the kitchen should be taken personally. That’s the only way one can survive in this industry. Being a Chef isn't an easy and as glamorous a profession as it may seem. When really worked up, how do you let off steam? When I am worked up, I try to distract myself. Music is a great distraction– it’s food for my soul. The retro songs ‘Footloose’ and Shakin’ Steven’s ‘You Drive Me Crazy’ work as phenomenal energizers for me! We still see kitchens outside the house as mostly a male-dominated territory. What's your take on that? How do you manage the men? Yes, the industry is still male-dominated. I think it’s mostly because it’s a very demanding job. One needs to put in long hours at work. Holidays and festivals take a back seat. Those are days when the work peaks. As far as managing men in the kitchen is concerned, I think if you know your job well, everything else falls into place. At work, I have around ten male chefs reporting to me; doing your job well and being assertive ensures an absence of floating egos. What is that one piece of advice you would share with young girls dreaming to become chefs? Cooking professionally is not the same as cooking in your home kitchen. If you have the heart for it, do it. Passion is very important. Just like our male counterparts, we too have fire in our belly to go out there, dream big and achieve it. Which lady chef inspires you? As a fan of French cuisine, I find Julia Child an inspiration. This quote by her always rings true for me - ‘Cooking is like love. It should be entered into with abandon or not at all’. On a lighter note, which one do you love more - eating or cooking? I love cooking more! Whether it is noon or midnight, I am always ready to rustle up something in the kitchen with whatever ingredients I can find in my fridge.